With our Dice Bag Sets, you can offer a complete Dice Set Package that people will be sure to hold on to. 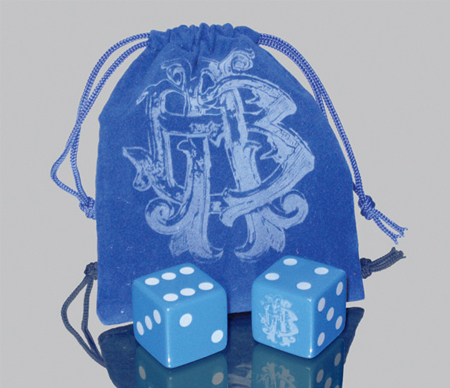 These Dice Sets feature a pair of Custom Dice in an Imprinted Velveteen Drawstring Bag. Our Dice Pairs in Velvet-Style Bags are available with 5/8", 3/4", and 1" Opaque or Transparent Regular Custom Dice in a range of colors, including White Dice, Red Dice, Blue Dice, Black Dice, Green Dice, and more. All our Custom Dice are available with any standard imprint color. The following Velveteen Dice Bag colors are available: Black, Burgundy, Hunter Green, Navy, Red, Royal Blue, and Silver with a Gold, Gary, Silver, or White imprint.